Cast: Fionn Whitehead, Tom Glynn-Carney, Jack Lowden, Harry Styles, Aneurin Barnard, James D'Arcy, Barry Keoghan, Kenneth Branagh, Cillian Murphy, Mark Rylance, Tom Hardy. A retelling of the Dunkirk evacuation - a crucial episode in the early years of the World War II. Allied soldiers fight for survival against seemingly insurmountable odds as German forces close in. 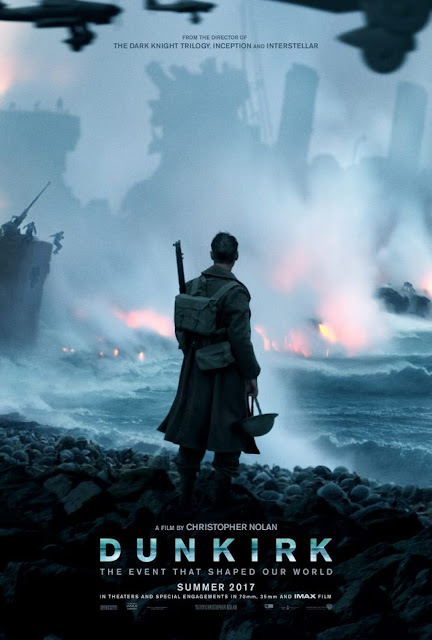 Dunkirk has been touted to be the movie of the year, not without reason of course, it's not every day that a Christopher Nolan movie hits the screens. Some have already hailed it as the greatest war film ever. Coming three Years after Interstellar and seven years after Inception, expectations are rather lofty and I for one am glad for the subject, mostly because Dunkirk isn't the third of the "mindf*ck trilogy". I had to watch Inception twice in order to ‘get’ it, and with Interstellar, I stopped trying. Thankfully, Dunkirk follows a far more conventional plot, and even though we are shown the story from three separate timelines that sometimes criss-cross but truly converge towards the end, it is not very difficult to follow after a while. No twists, no Ta-Da or a-ha moments, but all through its 106 minutes, you can’t help but be at the edge of your seat thanks to the tight screenplay, taut editing, and brilliant visuals and sounds. There is no background story or introduction here, the movie starts off by dropping us in the midst of a war-zone, and we barely get time to dust ourselves off as the almost nameless and always faceless enemy strikes, regularly and unflinchingly. This is Nolan's most ‘different’ film yet and credit to the director for pulling it off superbly. What is his biggest achievement is the fact that in this age of excessive CGI and visual effects where we have gotten used to watching buildings and planets being destroyed by aliens and cowboys, how amazingly real and painful the sequences appear. The sound of a single bullet hitting metal is enough to jolt us and make us panic for the unnamed soldiers whose lives are in danger. There is no single protagonist here, and very little dialogue is spoken during the length of the film, and this adds to the effectiveness of the plot. Almost all the actors are flawless in their performances and the emotions are subtle and not shoved down our throats; Bollywood would do well to take a leaf out of Nolan's page and abandon the jingoism we reserve for our war films (Lakshya being a rare exception). Is the movie perfect? Not really, Nolan being Nolan, some questions, while not left unanswered, kept me bugging well into the second half of the movie, and that felt a bit unnecessary, given the larger context. Also, the separate timelines, while they contribute positively to the film, take some time to get used to, particularly because of the abrupt cut-scenes. But this is nitpicking of the connoisseur kind. Watch Dunkirk, not because of the 'Kids watch Game of Thrones, and legends watch Dunkirk' memes, not because of Harry Styles (fine performer and at par with the rest of the cast except for the train scene), watch it for the horrors and the little victories of war, watch it to realise how good film-making can sometimes transcend the boundaries of the medium, and become something else altogether. And yes, watch it because you don't have to see it more than once to figure it out. I have not yet watched it , but after reading about it and its reviwes and i cant wait myself to watch it. once i watch it i will surely post my review about it.